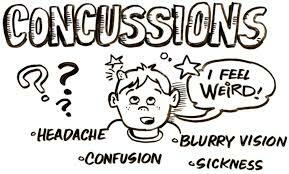 A concussion is a disruption in neurological functioning following a significant impact to the head or elsewhere on the body. This causes a biochemical imbalance within brain cells as well as decreased blood flow and temporary energy deficits within the brain. Following a suspected concussion, a player should be immediately removed from play, assessed and placed on complete rest in order to recover from the energy deficit. Studies have shown that any activity, both mental and physical, in the immediate days following concussion can delay the process of recovery and should be avoided until the athlete is completely symptom free. We recommend seeing Dr. Brar as soon as possible following a suspected concussion to be provided with a personalized plan for return to school and play. Dr. for Moms is one of the only clinics in Calgary focusing on pediatric concussions. If your child is involved in any sport, consider getting a baseline concussion test done. The problem is that symptoms do not coincide with brain recovery (just because you feel okay does not mean you are okay). The only way to know when the brain has fully recovered is to compare current brain function to when the individual was healthy; this is what is known as a “baseline test”. A baseline test is a series of tests that measure every area of brain function that could potentially become affected following a concussion. The reason that the test is termed a “baseline” is because it is done BEFORE the athlete gets injured. In order to know when an athlete has fully recovered, we first have to know where they were when they were healthy. Without having this information, there is no way to truly know when an athlete has fully recovered and is safe to return to their sport.